Our Lady of Sorrows. 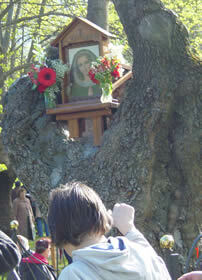 Tree (Ashtree) of the apparitions. 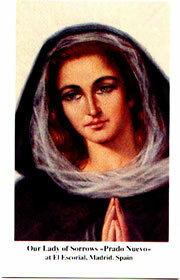 «I am Our Lady of Sorrows. I want a chapel to be built in this place in my honour. I want people to come here from all over the world to meditate on the Passion my Son endured, because it is forgotten. If they do people will be cured. This water will cure» (14 th June 198l). With these words of our Lady to Luz Amparo Cuevas the so called «apparitions of El Escorial» began, although she had already witnessed other signs in the sky before this happened. Luz Amparo was born in El Pesebre, Peñascosa, in the province of Albacete. She is married and mother of seven children, (one deceased). At present, she continues to recieve messages from Our Lady and Our Lord on the First Saturday of every month. This maternal insistence of Mary's is a sign of her love towards us, as we continue to have need of her warnings and advice, apart from the fact that she hopes to see her wishes for Prado Nuevo granted. (refer to message of 6-8-1988). The messages invite believers to pray and offer sacrifice; to recieve the sacraments of Penance and the Eucharist; to love God and our neighbour as well as the Pope; to practice humility and attend the poor... They give painful prophecies if humanity does not change, while at the same time giving hope with the assurance of the final victory of the Hearts of Jesus and Mary. Our Lady values the Holy Rosary very much; «it is my favourite prayer», she said on one occasion (15-8-1983). «My child, the Holy Rosary prayed with devotion is very powerful; I ask very little, that you pray, because by your prayer you will help my Son and I to save many souls» (Our Lady, 5-1-1998). «The greatest present you can offer my Son is to recieve the Sacrament of the Eucharist and the Sacrament of Confession» (Our Lady 5-1-1985). «Love the church very much, love the Holy Father» (7-11-1998). «Take refuge in my Inmaculate Heart; It will triumph at the end, my children». (Our Lady, 2-8-1986). To those who do all these things, I promise that they will go through Purgatory, not to partake in the trials of Purgatory, but to see the tribulations from which they have been freed by keeping these things that is why, the heavenly dwellings». (Our Blessed Virgin, 3-12-83). «All of you who come to this place will recieve special graces and many will be sealed with the special seal, the seal of the chosen» (Our Blessed Virgin 2-4-1988). «To all who have visited this place, I promise that I will manifest myself to them together with all the angels of Heaven, the Blassed and the Saints at the time of their agony». (Our Lord, 1-7-1989). «To all who help my Cause I will give a prize, and that prize will be the entrance to enter Heaven». (Our Lord, 5-10-1991). «I promise that those who come to this place on the first Saturdays of the month and recieve the sacraments of Penance and of the Eucharist, will recieve special graces to walk on earth. I also guarantee them eternal life, because I will keep them in The Light and they will not get lost». (Our Lord, 7-3-1998).